We add pork to many of our specialty products to add flavor, juiciness and texture so you will have the finest possible product to take home and enjoy. We make our specialty products all year long, not just during deer season. We take pride in our products and hope that you will too. For the best results, we ask that you make sure your wild game is properly cleaned and cooled before you bring it in. We reserve the right to refuse any trim not properly handled. Treating your venison with care will yield a high quality product. 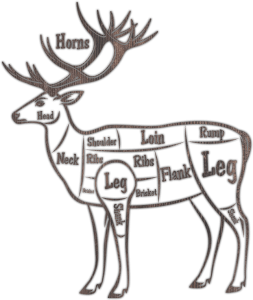 Deer processing may be mixed with other deer orders, with the exceptions of jerky and dried deer orders. All processed deer must be picked up and paid for in full within 10 days after receiving a call that it is ready. Deer not picked up will be subject to a storage fee. Orders received during early seasons may only take four weeks to process. Orders received after shotgun season starts in December may take up to eight weeks or longer. If beef and/or pork used in wild game processing is brought in by the customer, a $0.25 discount per pound (lb) will be credited to the statement. In’t Veld’s figures 5% shrinkage for bologna/summer sausage and 20% for meat sticks. In order to simplify pricing, the pork products, spices and/or cheeses used for processing are included in the processing price. No confusing multipliers or formulas to figure costs. Prices include vacuum packaging on all smoked products. Jerky and sticks will be packaged in a vacuum sealed pouch. Prices are subject to adjustments without notice due to changes in seasoning, beef and pork costs.